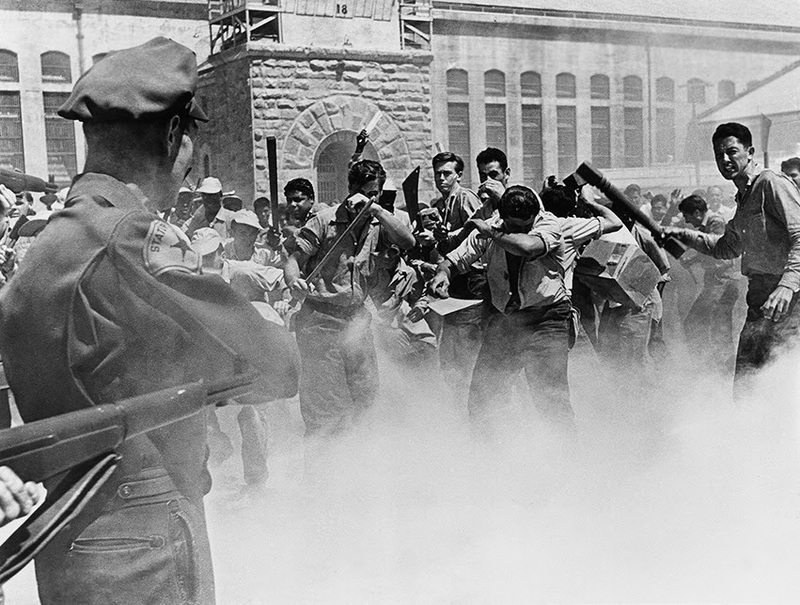 “X marks the wild animal,” according to a sadistic prison guard referencing the men in solitary confinement, but “Riot in Cell Block 11” (1954) portrays an environment that renders sweeping generalizations inadequate. In this torn-from-the-headlines film, the convicts who riot to protest inhumane conditions are a diverse lot. 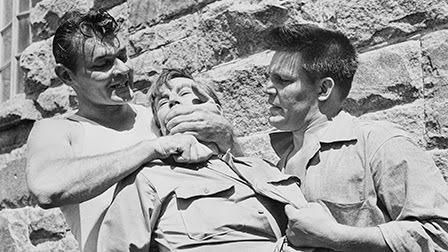 Dunn (Neville Brand), the de facto leader of the revolt, is in for robbery and murder and is described as psychotic, but while he struggles to control his violent temper he is no raving madman. Indeed, he matures surprisingly quickly into his role as a representative for many men, and the demands he issues are so reasonable (basically: stop abusing us and give us something to do with our time) that the warden (hard-boiled character actor Emile Meyer in one of his meatiest roles) admits that he had already made all the same suggestions to the state. Dunn's right-hand man Carnie (brawny Leo Gordon), one the other hand, is all sinewy menace ready to explode at any moment, but as the warden notes he should be back in the psych ward from which he was recently transferred. The Colonel (Robert Osterloh) provides a more extreme contrast; dignified and calm, the former soldier only wants to serve out the few remaining days of his sentence in peace, but reluctantly adapts a more active role when he realizes the rioters desperately need a voice of reason. Meyer's warden is tough but fair-minded. When the press and an irritating state apparatchik (Frank Faylen) cry for blood, the warden rattles off a series of depressing statistics about the lack of rehabilitation programs and the high recidivism rate. He knows there are no easy answers and that cracking the whip on prisoners is not only cruel and unusual, but also puts the public at greater risk when angry men with no skills and no hope are dumped on the streets. When asked what the prisoners are like, he observes that they're all different, just like people on the outside. 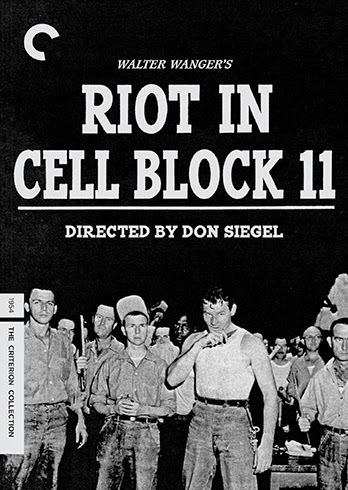 “Riot in Cell Block 11” may be a “quickie” genre pic, but Siegel and Collins certainly did their research. Producer Walter Wanger, who originated the project, conducted a different kind of research. In 1951, he became convinced that his wife, actress Joan Bennett, was having an affair with her agent; Wanger's somewhat imperfect response was to shoot and wound the man, netting Wanger (who pled temporary insanity) four months in jail. The experience rattled him and when a series of prison riots dominated the headlines over the next few years, he felt he understood why and wanted to make a picture that situated the prisoners as something more than the bloodthirsty animals the newspapers loved to linger on. Striving for authenticity, the film begins with newsreel-style footage about recent prison riots as well as testimony from the director of the California Department of Corrections who puts the blame for the wave of uprisings squarely on the shoulders of public officials and the public as well. Wanger and company share the sentiment, taking multiple opportunities to argue that only the public, a public that recognizes prisoners as real human beings with reasonable expectations for equitable treatment, can pressure their representatives to provide a solution. The film occasionally preaches, but the plea is both sincere and sensible. “Riot in Cell Block 11” shifts between the realism of its setting and no-frills shooting style, and the melodramatic clashes of the lead performers. Meyer excels as the warden, but the real standout is Neville Brand, a real-life tough guy who was a highly decorated (Purple Heart and Silver Star just to name a few) World War II soldier. His Dunn is one of the more complex characters you're likely to find in a prison film. He's neither demonized nor idealized. He's a violent criminal who seems all but certain to repeat offend once he's set free, and he often lashes out to the detriment of his own plans, yet he's bright and capable of restraining himself just enough to act as an effective negotiator. And in the subtlest touch of all, when he's asked (forced, really) to make the kind of sacrifice a more typical movie hero might gallantly offer, he's simply not ready for it. But he adjusts because he has to. The plot relies on a prison guard making a monumentally stupid mistake to kickstart the main action, and that detracts a bit from this otherwise pragmatic film's claim to realism. But that's just about my only objection to this tightly wound, no-frills thriller, one of Siegel's finest early works. The 1080p transfer is exceptional preserving a thick grainy look that enhances the authentic look of the film. Image detail is sharp, black-and-white contrast rich. This looks like a movie... shot in a real prison. And it doesn't look like a particularly nice place to spend time. This is a dual-format release including a single DVD and a single Blu-ray. The DVD has not been reviewed here. The linear PCM Mono track is, like the film, efficient. It is crisp both in presentation of dialogue and some of the hollow, menacing sounds that mark prison life: the iron clangs of doors, footsteps echoing in empty corridors. Optional English subtitles support the English audio. The film is accompanied by a commentary by film scholar Matthew Bernstein, author of “Walter Wanger: Hollywood Independent.” Obviously, Bernstein spends time discussing producer Wanger's substantial creative role in the project, and also provides historical background and details about the talent that contributed to the film. Two similar and unusual extras expand the collection. Don Siegel's son Kristoffer Tabori reads a chapter from the autobiography “A Siegel Film” (audio only – 25 min.) and a separate excerpt (13 min.) from the 1974 book “Don Siegel: Director” by Stuart Kaminsky. The former is more revealing with Siegel's detailed recollection of location scouting (they visited Alcatraz and San Quentin before settling on Folsom) and casting (neither Neville Brand nor Leo Gordon, an ex-convict himself, were obvious choices but both proved inspired). We also learn about the young personal assistant Wanger forced on Siegel, a kid named Sam Peckinpah. The second excerpt fills in some info as well. This “audiobook” format is a departure for Criterion, though I guess plenty of people are used to listening to books read by others. I'm not a huge fan unless it's the original author, but Tabori has a strong voice that commands attention. The final extra is “The Challenge of our Prisons” (59 min. ), excerpts from a March 1953 NBC Radio news special by journalists Peg and Walter McGraw. Three features that are all audio-only make for a somewhat dull collection of extras, and I wound up just skimming through the news special. I guess the choices were limited, but at least one video clip (a visual essay perhaps) would have helped a lot. Listen, “A Man Escaped” is the greatest prison movie ever made, and don't let anyone even try to tell you otherwise. But this early film from Don Siegel is a sharp, no-nonsense prison pic that delivers a message while also telling a taut story. Though there are no big names in the cast, some of the performances are exceptional, especially Neville Brand in the lead role. Strongly recommended.